A Gallery is an android widget that helps us to display items (images) in horizontal scrolling list and currently selected item at the center. 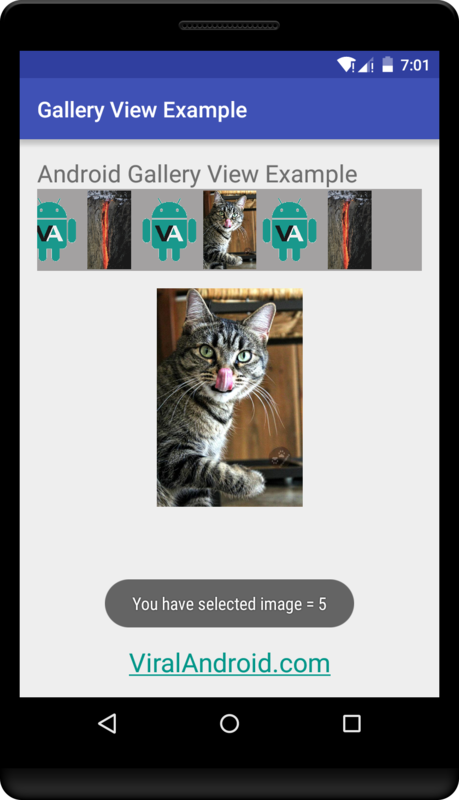 In this android gallery view tutorial, you will learn to display images horizontally and when you click any image, the currently selected image will be displayed in large size using ImageView and also show toast message when you select new item (image). In xml layout file, you have to add a Gallery widget and an ImageView widget and then give different id to them. Following is the complete example of android gallery view. That’s all. Now, run your gallery view android application and select any image which will look like output given below.